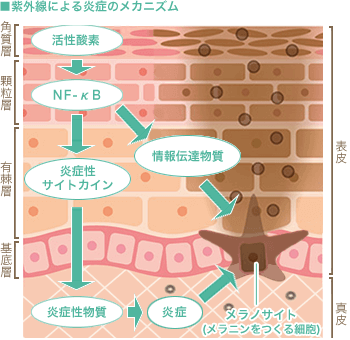 “Cosmetic Ingredient Review”（2007）「Final Report on the Safety Assessment of Aloe Andongensis Extract, Aloe Andongensis Leaf juice, Aloe Arborescens Leaf Extract , Aloe Arborescens Leaf Juice, Aloe Arborescens Leaf Protoplasts, Aloe Barbadensis Flower Extract, Aloe Barbadensis Leaf, Aloe Barbadensis Leaf Extract, Aloe Barbadensis Leaf Juice, Aloe Barbadensis Leaf Polysaccharides, Aloe Barbadensis Leaf Water, Aloe Ferox Leaf Extract, Aloe Ferox Leaf Juice, and Aloe Ferox Leaf Juice Extract」, <http://journals.sagepub.com/doi/abs/10.1080/10915810701351186> 2017年10月15日アクセス. 長岡 伸一, 他（2015）「アロエ含有物によるUVケアの研究 紫外線防御と一重項酸素消去作用」Fregrance Journal(43)(6),67-72. 寺尾 純二（2016）「生体における一重項酸素の生成と消去 – 酸化ストレスとの関わりを考える -」ビタミン(90)(11),525-536.